Will Chilika's new mouth devour the lake? chilika, Asia's largest brackish water lagoon, developed a new mouth near Gabakund village in Puri district of Orissa on August 1. The development has alarmed not only the residents of Gabakund and adjoining villages but also environmentalists who fear it may increase the salinity of the lake, famous for attracting migratory birds. "On the day the new mouth was forced open, water rushed into the village nearly engulfing it. Now the fisherfolk cannot cast their nets in the turbulent waters and are looking for alternative jobs," said Ashok Jena and Tofan Jena, fishermen of Gabakunda. The village has about 1,000 people. The new mouth, 400-500 m wide by now, is about 1.5 km from Sipakuda where the Chilika Development Authority (cda) had dredged an artificial mouth in September 2000. cda is a government body set up for the conservation and development of the lake. The villagers allege that the pressure created by the artificial mouth at Sipakuda forced the opening at Gabakunda. cda officials denied the possibility. Sudarshan Panda, cda's chief executive, said the mouth was created because pressure from high tides had eroded sand barriers. 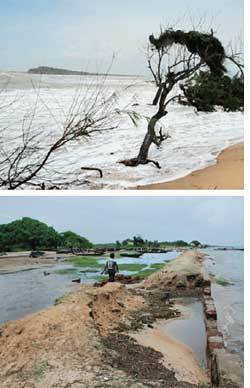 Chittaranjan Mishra, cda's additional chief executive, added, "The barriers are narrow with some only 3 m high. Waves as high as 5.3 m, overpowered them easily." The cda officials also denied any indication of the sea water entering the lake and increasing its salinity, which according to them had decreased from 11 ppt (parts per thousand) to 5-7 ppt in August as is normal during monsoons. According to Ramchandra Panigrahy, professor of marine biology, Berhampur University, the new opening may either help flush the sediments and waste carried in by rivers into the sea, or lead to the sea water advancing into the lake, thus, disturbing its ecosystem. He said there was a possibility of an increase in Chilika's salinity, and if it happened it would lead to an invasion of marine life. "The effect will be more on the fish and seaweed migratory birds feed on," he said. Panigrahy does not deny the possibility of the artificial mouth at Sipakuda having played a role in the creation of the new mouth. He also thinks that the artificial mouth was opened without proper research into aspects like the area's water holding capacity, strength of the sand barriers and the speed of the water currents. Environmentalist Biswajit Mohanty added that this definitely spells trouble for the Irrawady dolphins found in Chilika. He also expressed concern over the possible impact on the fisherfolk, though cda downplayed the threat. Mishra stated that a stone embankment had been raised at Gabakunda to protect the village and there was no threat to the livelihood of the people as they did not depend exclusively on fishing. The villagers insist that fishing is their only source of livelihood, which has now been destroyed. Scientists are seeing the bigger picture and are worried about the phenomenon of frequent depressions in the sea leading to an increase in wave energy. Subhranshu Bhushan Ray, director, Geological Survey of India, Bhubaneswar, said the opening of the new mouth in Chilika could have been caused by this phenomenon, which is specific to the eastern coast of the country. "Normal spring tide waves are as high as 1.87 m but when there is a depression in the sea, the height increases along with an increase in wave energy; this energy is dissipated by the waves hitting and eroding the shoreline. Sand, being loose material, is easily eroded," he explained. Ray also thinks cda should have undertaken the Sipakuda project after a more thorough study of the area. Nor does he rule out the possibility of the sea devouring Chilika in the distant future if the erosion of sand barriers continues.